As the hardtracking staff has dutifully noted, the New York Times is increasingly blurring the line between advertising and editorial. It’s State of the Cuisinart marketing. Sounds, well, vital – yeah? Now comes former Times investigative reporter Jeff Gerth’s fascinating Columbia Journalism Review takeout of the news and advertising pas de deux at the Times. The April 2 edition of the Sunday New York Times, where the paper features its best journalism, included a six-page special section, “Women Today,” pegged to a summit in Manhattan a few days later. The featured piece, on the state of the women’s movement, was by Tina Brown, the well-known journalist who founded the summit. In addition, eight women participating in the conference offered brief first-person accounts, and other articles appeared on topics that ranged from campus feminism to abortion. What wasn’t in any of the stories was the fact that the Times itself owned a minority stake in the conference. Although the paper’s own standards call for transparency in this area, the section didn’t disclose the paper’s financial interest. There are all kinds of other shenadigans going on at the Times as well. Dean Baquet, who has been executive editor of the paper since May 2014, says flatly that the traditional news-advertising divide has become a luxury the Times can no longer afford. You should read Gerth’s entire piece just for the priceless Half Moon Bay/New Work Summit Conference rumpus. Times business reporter fillets hedge fund manager Ray Dalio. Times monetizer Charles Duhigg woos Dalio to appear at conference. Times business reporter re-fillets Dalio on day one of conference. Dalio spends conference appearance filleting Times. Duhigg defends Times in aftermath. Dalio buys online ads re-filleting Times. Some run in the Times. As fascinating as Gerth’s piece might be, it was hardly exhaustive. One week later, the Washington Post’s redoubtable Paul Farhi filed this piece. 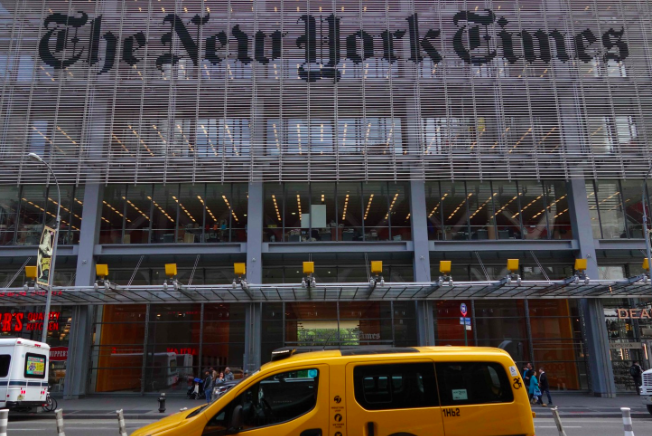 The New York Times will fly you around the world for $135,000. Is that a problem? It’s the trip of a lifetime — around the world in 26 days, with stops in nine countries. Just 50 people will travel on this guided tour next year via a private Boeing 757 to places like Marrakesh, Easter Island and Reykjavik, Iceland. The price: $135,000 per person. And that’s not all. Those who make the journey will be accompanied on various legs by journalists from the New York Times. The newspaper is organizing and promoting the package, which it calls “Around the World by Private Jet: Cultures in Transformation.” Among those scheduled to join the traveling party are Washington bureau chief Elisabeth Bumiller, op-ed columnist Nicholas Kristof and Publisher Arthur O. Sulzberger Jr. So – is that a problem? [T]he Times “essentially gives unrestricted access to some of the paper’s best-known journalists and names,” said Andrew Seaman, the chairman of the ethics committee for the Society of Professional Journalists and a reporter for Reuters. P.S. Yes, the Post piece did acknowledge its own checkered past in access-mongering. Although the question [about the Times promotion] is largely theoretical, the issue has come up before in a somewhat different context. In 2009, The Washington Post aborted an effort to produce “salons,” or small private dinners that would bring together the newspaper’s top editors and publisher with government officials and industry lobbyists. The off-the-record dinners were to be sponsored by individuals or corporations willing to pay anywhere from $25,000 to $250,000. Media reports about The Post’s plans triggered a public outcry. Critics said the paper was violating its own principles by peddling its journalists to vested interests and cutting its readers out of the dinner party. The acrimony prompted the paper to back away from the idea before it was ever implemented.